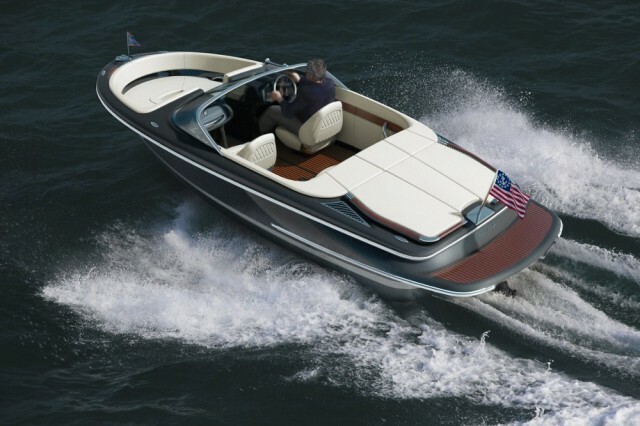 This new 25 foot runabout has a few tricks up its sleeve. Chris-Craft virtually invented the runabout market, having built tens of thousands of the sporty power craft since the early 1900s. So when the Sarasota, FL, builder let me know it was introducing a new 25-footer at its 2015 dealer meeting, I was excited before I even saw what it looked like. 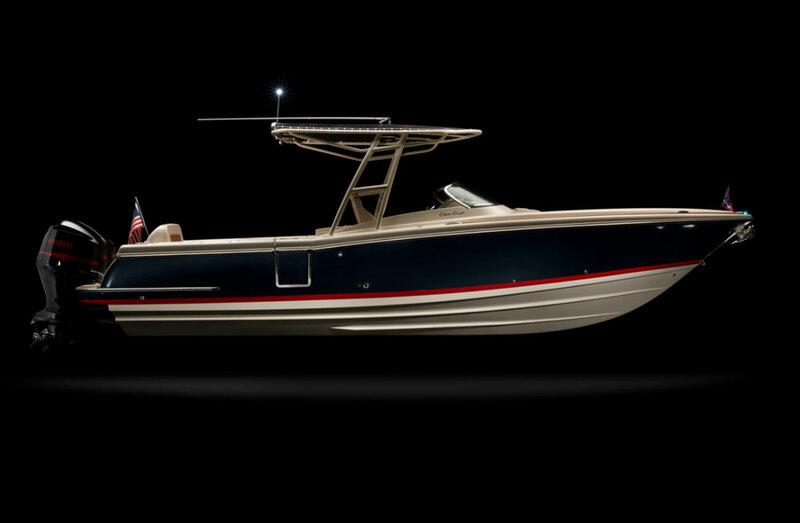 The brand-new Chris-Craft 25—a runabout with lots of accommodations. Chris-Craft's woodwork is renowned in the boating business, and for good reason. The foredeck on the Capri 25 is smothered in gorgeous teak. With beautiful bronze-colored topsides, creamy white deck trim, and gobs of rich teak decking, the Capri 25 is a stunner. Her lines are graceful but aggressive, combining a modern look with cues from designs almost 100 years old. Throughout I found incredibly good fit and finish, and I was straining to find an imperfection somewhere. I couldn’t even find one in the engine room, where the heart of this speedy craft lies. 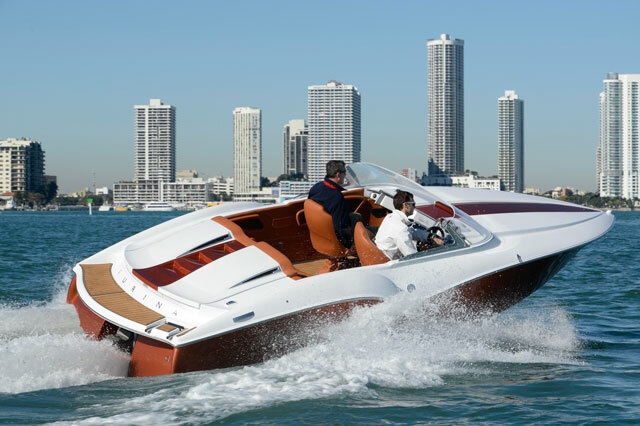 The standard engine in the Chris-Craft Capri 25 is a 300-horsepower Mercury 6.2-liter gasoline inboard with a Bravo III sterndrive, but the optional engine choices are nearly limitless. You can power up the Capri 25 with V8 gas inboard power up to 430 horses from either Mercury or Volvo Penta with Bravos or DuoProps. While diesel power is an option on the Capri 21, there's no box for it on the Capri 25's options list. While it may not seem as if it's a big deal, the port side walkway makes getting on and off the Chris-Craft Capri 25 easy. One thing I particularly like about the layout of this boat is the clever teak-decked walkway on the port side of the boat that runs forward from the swim platform. It allows you to board the boat very easily from either side, and then walk confidently up past the engine hatch before stepping down into the plush, comfy cockpit. Lots of runabouts do not have this walkway, which means you have to stumble your way up over the padded engine hatch. There’s a lot of cleverness in the cockpit, too. One place where runabouts tend to fall down is in their lack of entertainment space. More specifically, it may be difficult to serve beverages, snacks, or lunchtime sandwiches since there’s often no place for food and drink, other than your lap. Chris-Craft has solved this problem with two hefty solid teak tables that flip up from the side of the cockpit. Even better, the twin captain’s chairs in the forward end of the cockpit swivel all the way around to create a cozy eating and drinking area for about four cockpit occupants. I also really like the foldaway Bimini Top, which tucks under the aft cockpit seating. 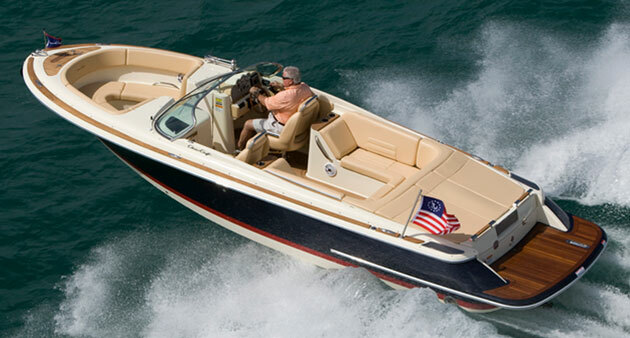 The Capri 25's clever cockpit arrangement offers lots of convertibility for entertaining. Access to the very utilitarian cuddy cabin, which has a V berth with a portable MSD concealed underneath it, is via a nifty centerline console door that has teak steps molded into it to aid access up to the foredeck. Particularly nice is that Chris-Craft vacuum-bagged most of the teak to the deck using epoxy, rather than utilizing lots of fasteners, which can cause problems later on. Are you ready to grab some beverages, pack up a sack full of snacks, and head to your favorite quiet cove with friends? The Chris-Craft Capri 25 has the accommodations to do it, in style and comfort. Other Choices: If classy runabouts are your thing, also consider the Cherubini Classic 20 or the Chris-Craft Capri 21, the Capri 25's smaller sister. 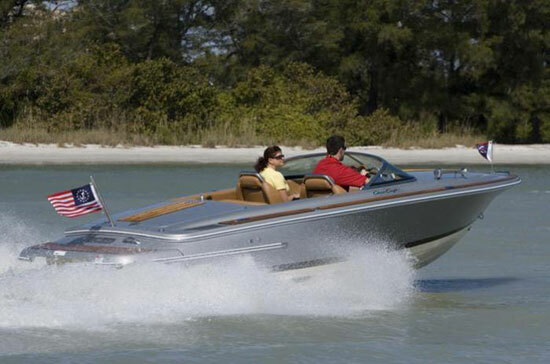 View Chris-Craft Capri 25 listings. For more information, visit Chris-Craft.